The conscience is the best and most impartial judge that a righteous man has. José de San Martín (25 February 1778 – 17 August 1850) was an Argentine general and the primary leader of the southern part of South America's successful struggle for independence from Spain. The remarkable protection granted to the Army of the Andes by its Patron and General, Our Lady of Cuyo, cannot fail to be observed. My promises to the people for whom I have waged war have been fulfilled — to accomplish their independence and leave the choice of their rulers to their own will. The soldiers of our land know no luxury, but glory. You will be what you must be, or else you will be nothing. If there is victory in overcoming the enemy, there is a greater victory when the man overcomes himself. I have fulfilled the sacred promises which I made Peru; I have witnessed the assembly of its representatives; the enemy's force threatens the independence of no place that wishes to be free, and that possesses the means of being so. A numerous army, under the direction of warlike chiefs, is ready to march in a few days to put an end to the war. Nothing is left for me to do, but to offer you my sincerest thanks, and to promise, that if the liberties of the Peruvians shall ever be attacked, I shall claim the honor of accompanying them to defend their freedom like a citizen. I have witnessed the declaration of independence of the States of Chile and Peru. I hold in my hand the standard carried by Pizarro when he enslaved the Empire of the Incas, and I am no longer a public man. Ten years of revolution and war have been repaid to me with usury. My promises to the people for whom I have waged war have been fulfilled — to accomplish their independence and leave the choice of their rulers to their own will. The presence of an unfortunate soldier, however disinterested he may be, is not desirable in newly constituted states. On the other hand, I am tired of having it said that I wish to make myself King. In short, I shall always be ready to make the ultimate sacrifice for the liberty of the country, but as in the character of a simple private citizen and in no other. As for my conduct in public office, my compatriots, as is usually the case, will divide their opinions; their children will render true judgment. Peruvians, I leave you with your national representation established. If you place your entire confidence in it, count on succes; if not, anarchy will destroy you. May Heaven preside over your destinies and may you reach the summit of happiness and peace. From this moment on, Peru is free and independent by the general will of its people and by the justice of its cause that God defends. Long live the nation! Long live the freedom! Long live the independence! (Declaration of the Peruvian independence, July 28, 1821). One should be under no illusions as to the future of the Old World. The real contest in the present day is purely social. In a word the struggle lies between him who has nothing and him who has. Figure out the consequences of such a principle, infiltrated in the masses by the harangues of the clubs and the reading of millions of pamphlets. Mercedes … this is the exhaustion of death. Mariano — back to my room. Of what my Granadiers are capable, only I know — who they equal will exist, who exceeds them won't. A well-fought defeat is worth more than a casual victory. José de San Martín … was an enigmatic figure — a revolutionary and a conservative, a professional soldier and an intellectual, a taciturn man who nevertheless was able to inspire the peoples of South America to follow his armies and accept his battle strategies. One of the great leaders in the wars for independence, he was a pivotal force in the liberation of Chile and Peru from Spanish rule. Segundo M. Argarañaz, in "Anthem to the Liberator General San Martín"
San Martin, behind the screen of the Andes, and only a hundred and fifty miles from Santiago, was forging a thunderbolt destined to shatter into fragments the edifice which Abascal had been so skilfully constructing through seven laborious years. The story of how the silent Argentine gathered and equipped the "Army of the Andes" has already been told … his marvellous march over the cloud-high passes, the descent into the plain of Aconcagua made so suddenly that the Spanish forces could not hurry up to bar his way, the prompt advance over the low transverse range which forms-the northern boundary of the plain where Santiago stands, and the overwhelming victory in the gorge of Chacabuco against the pick of the Spanish veterans, who confidently stood to the attack, never dreaming until San Martin was right upon them that his main body had had time to reach the spot. The Spanish authorities at Madrid and Lima had made the irretrievable mistake of underestimating the efficiency of his army. They thought the troops in Chile amply able to take care of any four thousand men the patriots could get together, but San Martin's army was differently provided and organised than the undisciplined masses which had been routed at Huaqui, Vilcapugio, and Rancagua. 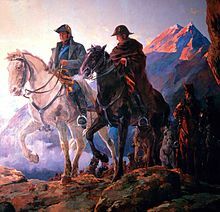 The Spanish generals were not so much surprised at his crossing the Andes as at finding the troops which reached the Chilean plains to be well furnished with artillery, cavalry, and ammunition, perfectly ready for an aggressive campaign, and a match man for man for any force that could be brought against them. The royalists lost twelve hundred of their best men at Chacabuco; only a thousand escaped from the field to fly in disorder toward Santiago. San Martin with his host of hardy gauchos and Chilean exiles assumed full control of the capital. He summoned an assembly of notables who promptly and unanimously elected him "Governor of Chile with plenary powers." But this was not what the far-sighted and patriotic soldier wanted. He realised that Chile could never give that unquestioning support so vital to the success of his cherished campaign against Peru so long as any stranger, even himself, governed by force. San Martin peremptorily declined the honour, but intimated that he would be glad to see his staunch friend, O'Higgins, selected dictator, and accordingly the enemy of the Carreras was placed at the head of the new Chilean government. Both ‪San Martín‬ and Bolívar have been accused by their enemies of plotting to make themselves kings, but most scholars agree today that there is no basis for either accusation. Bolívar, with his sense of drama, felt that to make himself monarch would mean a refutation of his entire past career. Such an attempt would render him ridiculous at the bar of history, and although he intended to keep political control in his hands, it was the control exercised by the power of a political chief, a kind of super-boss. ‪San Martín‬'s interests and talents lay in military campaigns. He had no aptitude for politics and it bewildered him. His personal ambition so often expressed in his letters, never varied. It was to hand the pacified country over to competent governing hands and then retire to Mendoza and end his days as a contented farmer. He was always the recluse, the ascetic introvert, and he was happiest in solitude. He evidently preferred some form of centralized republic, such as the Unitarios advocated, for Argentina and Chile, but for Peru he felt the feudal conditions there required a constitutional monarchy. … Few public figures have been pursued with such relentless hate, and for so little reason. He had a reserve and aloofness that was rarely penetrated and a scorn of stooping to say the popular thing that would curry favor. San Martin fostered a level of discipline and training unknown elsewhere in South America. 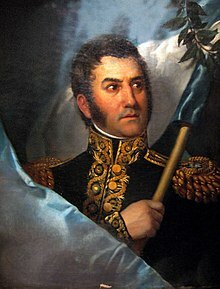 … San Martin founded an officers' academy, whose syllabus included mathematics and other sciences which he considered essential, and those failing to meet his high standards were dismissed: "I only want lions in my regiment," he declared.